The occupying military soldiers on Tuesday night arrested Sulaxan while he was riding a motorbike. 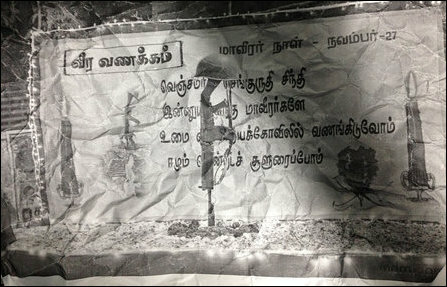 The SL military accused Sulaxan of being in possession of a poster paying tribute to Tamil Heroes on Maaveerar Naa’l. Mr Sulaxan has been handed over to the TID for interrogation, the SL police said. Commenting on the sense of uprising among the public against the SL military banning them from paying tribute to their fallen, a political commentator in Jaffna told TamilNet on Wednesday that the resolve to pay tribute to fallen Tamil heroes is getting further and further strengthened even as five years have elapsed since 2009 May (“Kaalam chella chella, veeriyam kooduki’rathu” ) in the occupied country of Eezham Tamils.